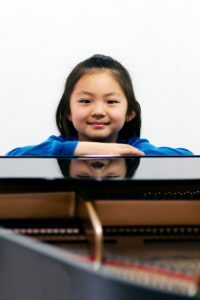 Making her debut at Carnegie Hall at eight, and winner of the Steinway Competition in her age category at Michelle’s Piano, Hailey Sun has already done more than most could ever dream! Hailey began taking piano lessons at her own request when she was three years old. Since 2015, Hailey has actively participated in Period Festivals of the Oregon Music Teachers Association (OMTA), consistently receiving “Winner” rankings each time. In 2018, Hailey won second place at the American Protégé International Piano and Strings Competition and had the honor to perform at Weill Recital Hall at Carnegie Hall in New York City in May 2018. In addition, she won first place in the Steinway Competition for the Oregon/Southwest Washington State region in Division I Category. Her current teachers are Dr. Renato Fabbro and Paula Watt. In addition to playing the piano and listening to classical music, in her spare time, Hailey loves to read, travel, swim and do arts and crafts. Hailey’s family has also just taken ownership of a brand new Steinway Model B to further enable her to reach her artistic potential. Michelle’s is thrilled to be part of this happy event!